Strictly speaking this should be made with lamb or beef, but I didn’t have any so made it with pork. It is very very delicious. The addition of spinach is colourful and very tasty indeed. I ate way too much as usual. 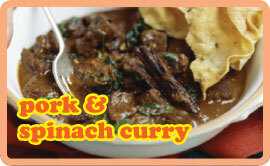 Incidentally, the picture (above) bears little resemblance to the finished curry. I couldn’t find anything online to do it justice, and the curry was eaten before I thought that maybe I should have photographed it. It looked nice though. Apologies. Combine the yoghurt, coriander, cayenne pepper, paprika, ginger and garlic together into a paste and set aside. Heat the oil in a large lidded casserole pan over a medium heat and fry the meat in batches until lightly browned – set aside in a large bowl. Add the onions to the same pan and fry with a little salt for 4-5 minutes until lightly browned. Add the yoghurt paste and fry for a further 3 minutes until the oil separates slightly. Return the meat to the pan and add the tomatoes. Stir briefly then add 1 1/2 cups of warm water and the salt and stir in. Bring this gently to a boil, then reduce the heat and cook for 1 1/2 hours until the meat is very tender. Stir in the spinach, chillies, coriander and garam masala and cook for 3-4 minutes. Remove from the heat and serve. Best served with some plain boiled rice. And a large comfortable sofa to recover on.